If you’re looking to record underwater seascapes or artful pool pictures, GoPro lets you easily capture submerged scenes. Whether you’re using the new HERO5 models, or a previous generation model, you can capture underwater scenes with relative ease and little worry. The HERO5 Black comes with a built-in LCD screen making it possible to monitor and frame the scene right out of the box. Previous versions are a little more challenging, when it comes to viewing the scene. Normally, you would monitor the scene with your smartphone, but that’s not feasible for underwater recording because of the whole water-is-wet thing. So, there’s a little more guessing involved. Of course, you could also attach the optional Touch BacPac (see the next section) on most HERO models, Session excluded. The Touch BacPac allows you to monitor the scene from the back of the camera, but it’s submersible only to shallow depths, and the touch panel won’t work underwater. Antifog inserts: These inserts drop into the camera’s housing to prevent fogging in cold and humid environments. You can reuse them several times by drying them out in a 300ºF oven for 5 minutes. A big media card: You can’t change the card underwater (or anywhere that’s even slightly moist, for that matter), so it’s a good idea to use the biggest one you can afford. Color-correction filters: Underwater scenes are beautiful, but they have blue or green casts. An optional color-correction filter in red or magenta can reduce or eliminate the cast. Floaty Backdoor: This accessory attaches to the back of the camera and keeps it afloat in case you accidentally let go of it while taking an underwater selfie (see the following figure). Any time you play in the water, there’s a risk that the camera will take more of a plunge than you’d like. Thanks to this bright-orange back, however, you’ll have no problem spotting it in the water. Dive Housing: The waterproof housing that comes with the camera works well for most underwater situations, but if you want to take the camera deeper, consider this housing. It’s more durable than the standard model and is waterproof to 197 feet (60m). The kit includes Standard, Skeleton, and BacPac backdoors. Its increased durability makes it perfect for more serious diving encounters. And its glass lens delivers optimal sharpness in and out of the water. While the HERO5 Black is already waterproof to 33 feet, to go deeper requires the optional Dive Housing. The Handler: The handgrip provides stability when holding the camera. It’s great for use in and out of the water, and will float if you accidentally drop the camera. Scuba mask: The GoMask is a cool third-party accessory that lets you wear the camera on your face while snorkeling or scuba diving so you can see what you’re capturing. Video lights: You can get a complete light system that mounts on a rack with your GoPro and provides up to 900 lumens of illumination for densely lit underwater scenes. 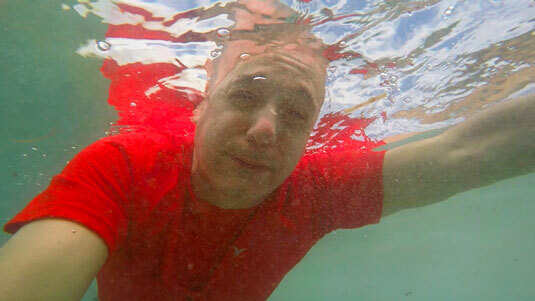 Having the Floaty Backdoor is a smart idea when taking your GoPro in the water for an underwater selfie.